There have been a few recent reports of the mounting screw for the PC board coming loose. The screw will not exit the board because the rotor comes in contacts with it, but the screw should be checked, tightened and locked with Permatex Threadlocker "Blue" or LocTite "Blue". 2. Remove the hold down screws for the plate. 4. 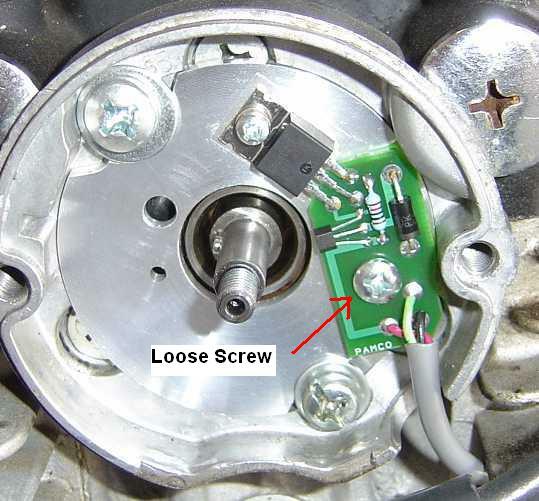 Loosen but do not remove the screw. 5. Drip a drop of the "Blue" threadlocker in the screw hole on the back of the plate. 7. Wipe any excess threadlocker from the plate. I did it when it was installed. I also tossed the original hardware and replaced it with stainless allen screws. The Voices In My Head Tell Me Things -- Bad Things. Do you mean the hold down screws for the plate? Maybe those voices aren't so bad after all! I also replaced the plate mounting screws with allen heads. I'll check mine. You don't HAVE to be crazy to run into burning buildings, but it HELPS! On an XS you won't pass yourself on the road everyday.